Polysomnography, also called a sleep study, is a test used to diagnose sleep disorders. A sleep study records your brain waves, the oxygen level in your blood, heart rate and breathing, as well as eye and leg movements during the study. 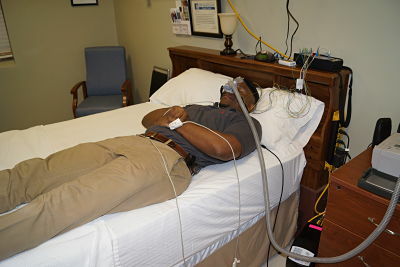 A sleep study is done at a sleep center within the hospital. You will be asked to come to the sleep center about 8:30 in the evening for the sleep study so that the test can record your nighttime sleep patterns. In addition to helping diagnose sleep disorders, sleep studies may be used to help adjust your treatment plan if you've already been diagnosed with a sleep disorder. A sleep study monitors your sleep stages and cycles to identify if or when your sleep patterns are disrupted and why. The normal process of falling asleep begins with a sleep stage called non-rapid eye movement (NREM) sleep. During this stage, your brain waves, as recorded by electroencephalography (EEG), slow down considerably. Your eyes don't move back and forth rapidly during NREM, in contrast to later stages of sleep. After an hour or two of NREM sleep, your brain activity picks up again, and rapid eye movement (REM) sleep begins. Most dreaming occurs during REM sleep. You normally go through four to six sleep cycles a night, cycling between NREM and REM sleep in about 90 minutes. Your REM stage usually lengthens with each cycle as the night progresses. Sleep disorders can disturb this sleep process. A sleep study monitors your sleep stages and cycles to identify if or when your sleep patterns are disrupted. A sleep study is a noninvasive, painless test. Complications are rare. The most common side effect is skin irritation caused by the adhesive used to attach test sensors to your skin. You will be asked not to drink alcohol or eat or drink anything with caffeine during the afternoon and evening before a sleep study. Alcohol and caffeine can change your sleep patterns, and they may make symptoms of some sleep disorders worse. You arrive at the sleep center about 8:30 in the evening for the sleep study and stay overnight. You may bring items you use for your bedtime routine, and you can sleep in your own nightclothes. The room where the sleep study is done is similar to your bedroom at home and is dark and quiet during the test. You don't share the room with anyone else. 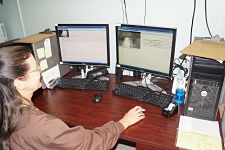 The room has a video camera, so the polysomnography technologists monitoring you can see what's happening in the room when the lights are out, and an audio system, so they can talk to you and hear you from their monitoring area outside the room. In the morning around 5am you will be awakened, the sensors are removed, and you may leave the sleep center. You can return to your usual activities after polysomnography. The information gathered during the sleep study is evaluated first by a polysomnography technologist, who uses the data to chart your sleep stages and cycles. Then, that information is reviewed by your sleep center doctor. Once the results have been reviewed you will either be scheduled for a follow up CPAP study or set up with the sleep center doctor to have your results reviewed with you. If your study determines that you need CPAP equipment D.W. McMillan Home Medical Equipment can help you through the process. To learn more Click Here to go to D.W. McMillan Home Medical Equipment's Website.